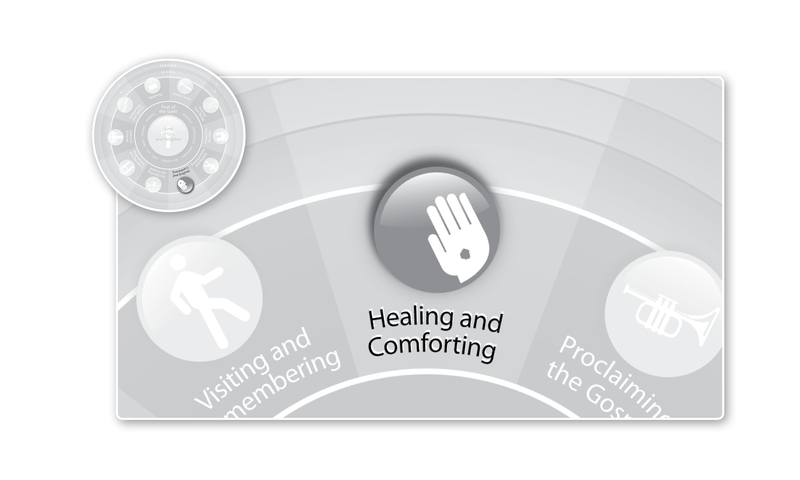 Now, with these last few blog posts in place, it’s time for us to turn to our overarching subject for the month: What does fixed hour prayer have to do with the Work of Mercy of healing? In The Whole Life Offering, I write about the origin of the concept of the hospital. You can read about that in more detail there, but let me just summarize what I wrote by sharing that the earliest hospitals were places where mature Christians guided ill Christians—and even ill nonbelievers—through fixed hour prayer as a healing process. These Christians prayed together with patients, not just for them, until they recovered or passed away. Now, that is revolutionary to our understanding of the purpose of the hospital and what it means to heal! We may have assumed that what early Christians—the founders of the first hospitals—did was to use whatever primitive medicine they knew to cure the bodies of sick people, or to provide them physical care and relief. And indeed, that was part of what happened in hospitals. But as historian Rotha Clay notes, that was the lesser part of what happened in hospitals, not the greater part! It will be well to make clear what the hospital was, and what it was not. It was an ecclesiastical, not a medical institution. It was for care rather than cure: for the relief of the body, when possible, but pre-eminently for the refreshment of the soul. By manifold religious observances, the staff sought to elevate and discipline character. They endeavored, as the body decayed, to strengthen the soul and prepare it for the future life. Faith and love were more predominant features in hospital life than were skill and science. I, __________ the which am named into a poor man to be resceyued into this Hospital after the forme of the Statutes and ordanacions ordeyned…shall trewly fulfille and obserue all the Statutes…in as moche as yey longen or touchen me to my pour fro hensuorthwardys…without only fraude soe helpe me God and my Holydom and by these holy Euangelies the whiche y touche and ley my honde upon. Illness, then, was not the occasion for a new kind or brand or type of prayer but rather the occasion for a new reliance on the kind of prayer one ought always to pray and the life of regular daily prayer one ought always to practice. It is no exaggeration to say that the hospitals of thirteen centuries brought healing by teaching the sick to pray and by providing them the framework in which they prayed daily and were enveloped by prayer. Medicine was neither absent nor central. Prayer was all-encompassing, and, through it, patients participated in their own care and the care of others. The almsmen of Ewelme after private prayer by their bedside, attended matins and prime soon after 6 a.m., went at 9 a.m. to mass, at 2 p.m. to bedes, at 3 p.m. to evensong and compline. At 6 o’clock the final bidding prayer was said around the founders’ tombs. What did Christians do when they were sick and went to the hospital? They prayed throughout the day with those who were well. And remember this: They prayed the daily prayers, which meant that they didn’t pray only for—or even primarily for—their own healing. Now, what should we do when practicing Work of Mercy of healing and comforting? We should pray throughout the day with those who were sick. And remember this: We should pray the daily prayers, which means we don’t pray only for—or even primarily for—others’ healing. How might a prayer like this read? Do any come to mind from Scripture or Church History? This entry was posted in Uncategorized and tagged Christianity, Healing and Comforting, Hospitals, Prayer, Whole Life Offering. Bookmark the permalink.